I spotted this picture over at What Would Emma Pillsbury Wear, which featured a sneak peak into Jayma Mays' recent cover shoot. This was one of the outfits among the shots and I fell in love with it's graphic simplicity. As a side note, I have posted on the 15 Dollar Store in the past, but it's been awhile since I highlighted the store. They offer broad selection of name brand junior clothing which can be found at well known department stores at full price for just $15. It's worth a look. What do you think of the outfit? Is this something you would wear? Leave your thoughts below. Oh, it's perfect. Everything about it. She's so pretty and I love her style. So cute! 3 of my favorite things... black and white combo, stripes, and leopard print! I saw this on wwepw.com and I love the idea of stripes and leopard so far apart. Even though they don't have the same base color, etc, they're just treated as neutrals. Love it! 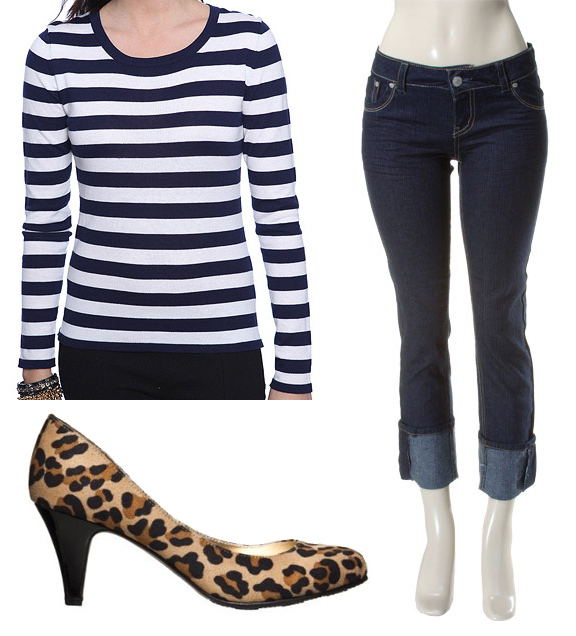 Love wearing two trends at once- the nautical and the leopard! I love this outfit... I am totally re-creating! i am so thankful you shared this with all of us and i love the affordable version of her uber cute outfit. it was awesome meeting you (in the restroom!) at alt today and i will definitely be coming back to your blog! I came across this too! I would totally wear that outfit! And I loved all the poses! I'm using acouple for my photo shoot with my guy and I.
I'd be all over this! I love the simplicity and sophistication of it. My husband thinks I'm crazy when I tell him I like the animal print shoes (just the shoes, nothing else) But I think they would make a statement to a simple outfit. Ya would definitely wear this one when going out with friends but not for the party or any occasion. It is one the best color combination which one can wear while going out with friends. I've been wanting to do a Jayma Mays look! Love it. It was fun to meet you this weekend!